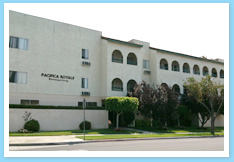 Pacifica Royale Assisted Living Community is a well-established alternative for families who want to provide their loved one's aging needs. We value the preservation of privacy and choice. Our place offers an ambiance of lightness and permissibility for any possibilities. For a low cost, you receive care yet continue to hold your autonomy. We are a licensed residential care home for the elderly. For a monthly fee, you receive three meals daily, cooked and served in our main dining room, a full activities program, routine and emergency maintenance service, daily housekeeping, scheduled transportation for doctor's appointments, shopping, banking etc. and a 24-hour emergency call system. Our caring staff members are trained to give professional, around-the-clock services and care for our residents. Each one has received certification in First Aid and training in emergency cases. To learn more of our ideals about caring for the elderly, we welcome your calls and visits anytime. You may also send us a message.